It's not hard to tell if you have a problem with clutter. All you have to do is look around your home and see the mess. When you have a problem with clutter, the first thing you feel upon coming home is dismay! The home that is supposed to nurture you and replenish you so that you can face the challenges of life is instead draining you and making you sad. You feel ashamed to invite people to your home. Or maybe you dare invite people to your home, but God forbid they open any cabinet or closet doors, because you would fear for their lives. 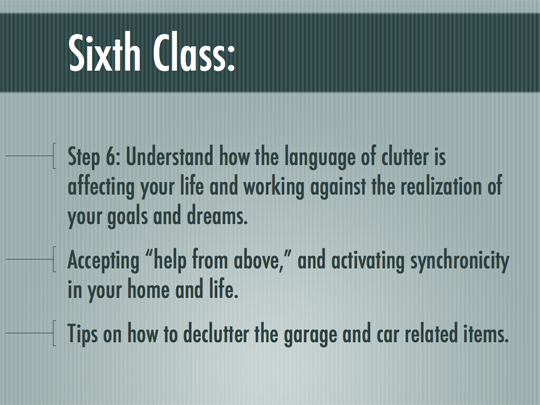 If you have a problem with clutter, you already know it. No one has to tell you. What you need to determine now is if this is a problem you can solve on your own or if you need help. After all, you have been saying for years that you know what to do, you just have to do it. But that must not be true, right? Because the years keep going by and you don't actually solve this problem. The clutter is still there, and let's face it, it is actually getting worse. I have the solution to your problem right here, on this webpage is the program that can teach you the things you need to know and tell you the things you need to know to actually declutter. But you have to do your part. This program consists of 12 video lessons, which are delivered to you once a week. Every lesson comes with very easy, simple tasks that you need to do as homework at the end of every lesson. You watch one lesson per week, but you actually have to sit and watch the lesson from beginning to end, no multitasking allowed. Then do the homework. As I said, this homework is very easy to do, but you HAVE TO DO IT. 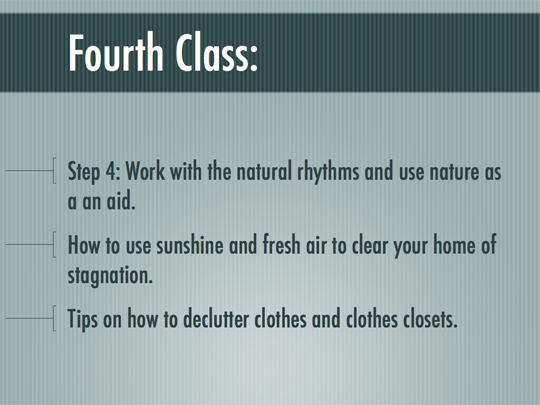 The homework is so important because the tasks in the homework that I give you in this course were designed to change your heart, this is why it is called Declutter from the Heart. You may think that your clutter does not bother you, or that you have become used to it. You may even have tried to convince yourself that you like it. Well. you never get used to clutter a person cannot get used to what is bad for them, but you can become numb to clutter or you can develop a sort if addiction to clutter. All my programs and courses come with a 30 day money back guarantee. What do you have to lose? A cluttered space is a sign of a cluttered heart! You don’t need will power or self-discipline to declutter and keep a tidy home, all you need is to put your heart into it. If your heart is in it, everything follows. 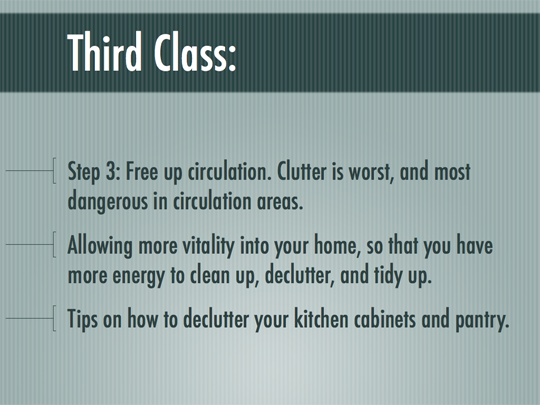 Please watch the promo video above to explore the 3 principles I use when I teach folks how to declutter. 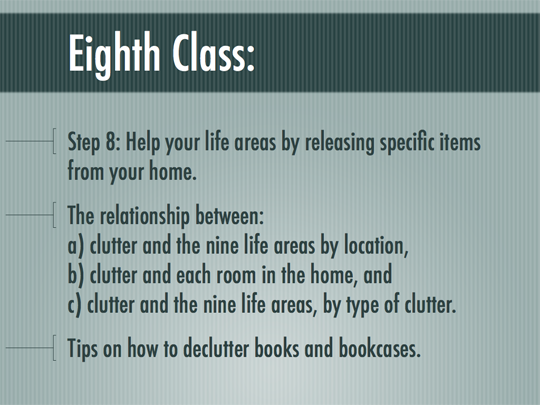 The class Declutter from the Heart uses the Nine Steps to Feng Shui® System, which is a method for practicing Feng Shui by-the-numbers, that is very easy to learn and apply. Clutter is produced by a reluctance to make decisions. Accumulated clutter is nothing but decisions delayed. The only way to avoid the accumulation of clutter is to have in place systems that make decisions easy and automatic. Home organization can only be effective when things are categorized and organized in the same way as your memory works. It can only be sustained in the long term when your space holds easy and evident reminders of where things have been put away. Ugly organization aids only add to clutter and never help reduce it. More organizing gadgets are plain ugly. It is only through the incorporation of beauty in your storage systems that you can truly relate with the home in a way that keeping tidy and organized becomes a joyful, fulfilling experience for your heart and soul. Instead: align the purposes of your heart and mind by using the power of the Deeper Mind. Generate new, healthier habits, that are very easy to keep up. Wu-Wei is the Chinese art of Effortless Action. Part of Wu-Wei is seeking the "path of least resistance." Is done in 9 easy steps. 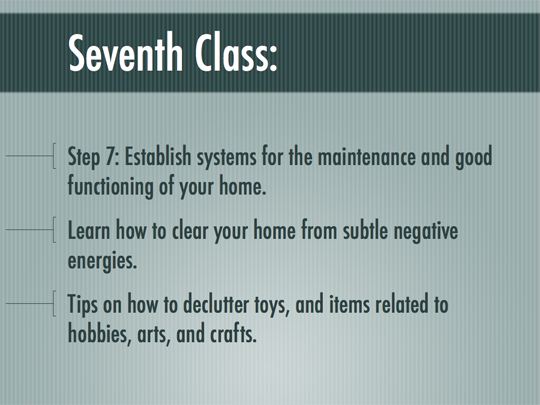 The course addresses how different types of clutter affect each of the Nine Life Areas in Feng Shui, and what to do about it. It includes access to a Facebook support group, where you can ask questions, and share photos and videos to get direct feedback from Moni. 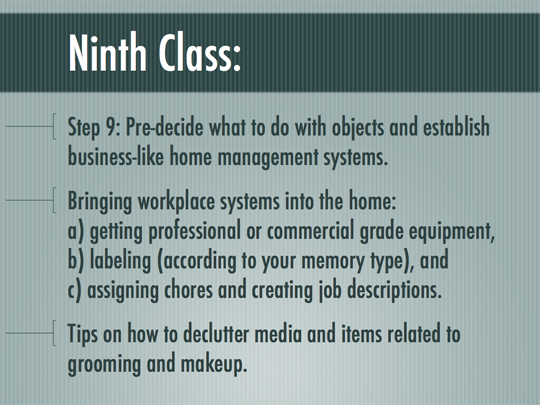 If you are curious, scroll down to check out the class curriculum and see what the Nine Steps to Declutter are about. 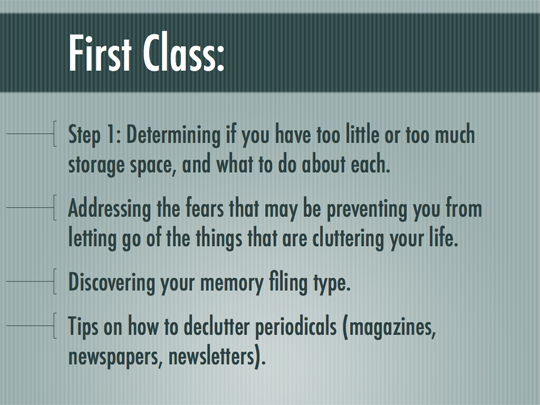 I learned about the Decluttering [from the Heart] Course from Moni and I knew I needed to do decluttering as I still hadn't been able to handle all my paper, books and things in the garage - even after the numerous previous books and courses I had bought over the years. I knew something was missing from the previous courses because it was never sustainable, felt like drudgery and I regretted getting rid of some important things while still didn't declutter what needed to go. Before starting I felt anxiety, stress and desperation. 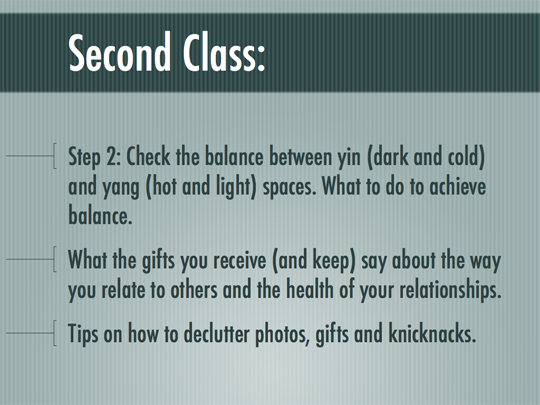 Throughout the course all of this disappeared - not because I "decluttered" but because I applied the wisdom and teachings of Moni and Feng Shui For Us. Decluttering from the heart is just that - the shackles and patterns stuck energy gets removed without a lot of "doing". And if I have to use a word - it's MAGICAL. That's all I can say. Truly magical. The course starts as soon as you enroll, and access to the videos never ends! It is a completely self-paced online course - you decide when you start and when you finish. Access to the Facebook group does not expire either. 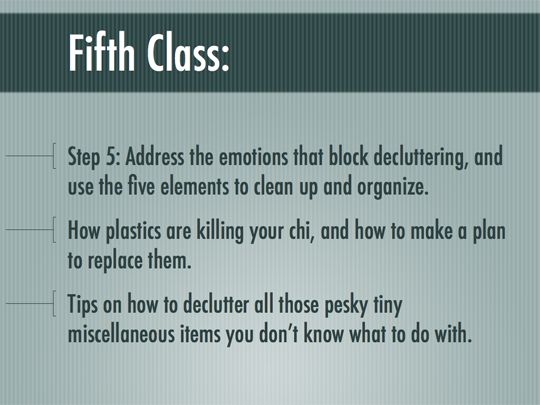 You can continue to get support online from Moni as you progress in your decluttering. Under each lesson, there will be a section for comments. You can post your questions there, and Moni will answer them on the same page. You can also post questions in the Facebook group. I discovered Moni's blog and videos about 8 months ago, and her sincerity and thoroughness hooked me in. I especially appreciate her clarity and insight bringing together architecture and design with exhaustive study of different schools of feng shui. 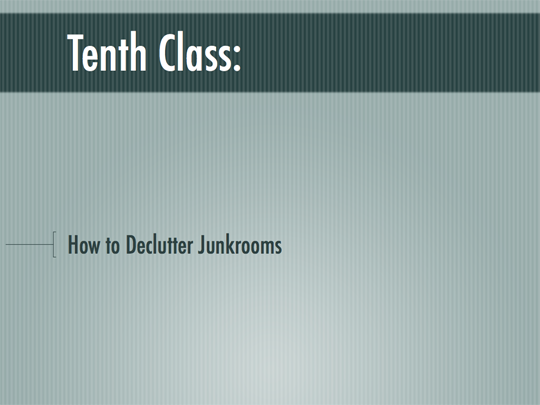 When the Decluttering from the Heart course came along, I knew right away it was what I needed. Clutter is in the way of everything for me, and I have spent years on my packrat tendencies only to attract clutter over and over again, so I knew that my changes truly needed to come "from the heart." I cannot claim a miraculous transformation of my entire home-- yet. When I told one friend I was going to take this course, she said, "You don't need a class. You know what you need to do-- just do it." I felt a little shame, like there was some truth to that and *I* was the problem, but I felt like I needed the class anyway. Now I am empowered to remove obstacles and let the process be easy. I could not "just do it" before" but I can now, and I can recognize when not to push, when to let something be and look for movement in other areas of my life instead. I am less likely to beat myself up over what's not getting done, and I can more easily make a decision and then follow through. It is easier to let things go that have been accumulating in my house. To keep your spaces unencumbered by clutter, you need to learn how to confront and live life from a place of health and happiness. 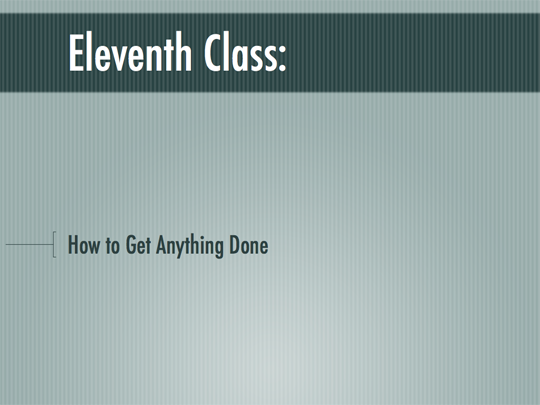 This course will teach you exactly how to do that. This is a pre-recorded online course, which was recorded with a live online audience. I will also invite you to join a Facebook group where you can post photos and videos of your particular situations, to get direct feedback from me. If you do not declutter now, when will you? After all, you know that PROCRASTINATION is one reason you are in the mess you are!